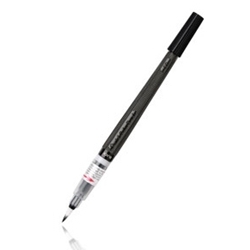 Enjoy neat, non-stop painting on the go with this refillable paint brush pen system. These pens consist of an ink-filled, squeezable barrel with a durable and long lasting brush tip made of flexible nylon filaments. A variety of lines from fine detail to broad sweeping strokes can be produced, making the brush pen suitable for stylized design work, oriental artwork, calligraphy, cartooning and transparent watercolor effects. Refill cartridges are available.